Five journalists have resigned at a group of cuts-threatened weekly newspapers where staff are due to begin industrial action today, the National Union of Journalists has claimed. The NUJ says the quintet have left Newsquest South London since the company announced plans to axe 11 editorial roles across its 29-strong newsroom, with all bar two staff on notice of redundancy. Union members at the group are set to begin a ‘work to rule’ today, and have also voted in favour of strike following a ballot held before the announcement was made. 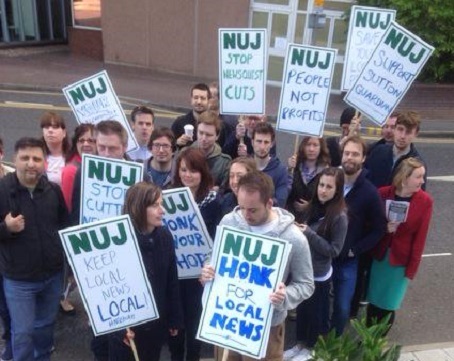 The group’s NUJ chapel now says it has “no choice” but to consider further industrial action. A statement issued on behalf of the chapel reads: “The company’s proposal for the future of this newsroom and its news output is indicative of its continual lack of appreciation for its editorial staff, and its repeated failure to recognise the hard work and professional pride that goes into their work. “It is a great shame that, despite our repeated efforts over the past few months, our managing director and those above him will not speak to our chapel to find a way to solve this dispute. We want nothing more than to resolve this in the best interests of both parties in a timely manner. Several South London MPs and London Assembly members have written to Newsquest about the planned cuts. Siobhain McDonagh, MP for Mitcham and Morden, said she feared “young trainees who start off thinking they are beginning their dream career are dejected and burned out by the workloads and lack of support”. Laura Davison, NUJ national organiser, said: “There is a stark dichotomy between management’s bunker attitude and the appalling reality on the ground for badly treated Newsquest employees in South London. We are grateful for the support we have received so far from politicians across the spectrum in south London and the NUJ Parliamentary Group. Newsquest has declined to comment. I’m sorry but how on earth does quitting help this situation? If they’ve decided to embark on a new careers because they’re fed up with the state of local journalism, I wish nothing but good luck to them. If they’ve done it simply to make a point, then all they’ve done is make it easier and cheaper for Newsquest South London to plough ahead with the proposed changes. Think about this… if a council wants to cut three bus routes, it announces that it’ll be cutting five. In the public uproar which follows, a campaign group forms and meets with the council to discuss to the issues on both sides. The council eventually concedes in cutting only three and the campaign group celebrates how it saved two bus routes. Sound familiar? Do we know they haven’t received redundo? Unfortunately that is only half the story. It depends more upon persuading enough members of the public that such is a service worth paying their hard earned cash to support. The last 40 odd years have showed that newspapers have manifestly failed in this task. Circulations drain like a puddles in the desert and the industry is incapable of applying a plug. Their almost universal reaction to this unfolding cataclysm is for regional newspaper groups to embark on a slash and burn policy whilst leaning ever more heavily in the ever-popular regional press pick me up of constantly increasing the cover price of products nobody really wants to buy. Economic and common sense indicate that the chances of the British regional press surviving in anything like its present form are very slim indeed. We will all miss it when it is gone; democracy will be the poorer for its demise; but, barring a miracle close to divine intervention, we are witnessing the last act in a great British tragedy. RIP the British regional print press doomed to a premature death by complacency. Given how fast staff turnover is there anyway, I’d say they have all seen what was coming and gone for other work straightaway. Quite possible they are shifting on the nationals now. You either quit or accept the redundancy package, I can’t imagine anyone would be stupid to leave without redundancy, unless they have worked for less than two years then they wouldn’t get a payout, so can quit without losing out. Either way, good luck to those who leave and commiserations to those who stay, it aint going to be fun! If they quit because they thought they were making some kind of grand statement, or that it would change Newsquest’s attitude towards cuts in general, it was clearly doomed to fail and a tad pointless. But if it was simply because they were young, fed up to the back teeth of their working conditions and not eligible for redundancy anyway, I can’t blame them for just cutting their losses and putting all their energies into finding something better.